Exeter College, which we enter from "The Turl," formerly a narrow opening through the city wall into the High-street. It derives its name from its foundation, in 1314. by Walter Stapledon, Bishop of Exeter, whose design was frustrated by his untimely death. It was, however, incorporated by charter of Queen Elizabeth in 1565, when Sir Wm. Petre contributed munificently towards a second endowment. The W. front, by which we enter, is 220 feet in length; its gateway tower was rebuilt in 1595, 1703, and 1834, at which latter date the whole front was newly faced. Left: The Library. 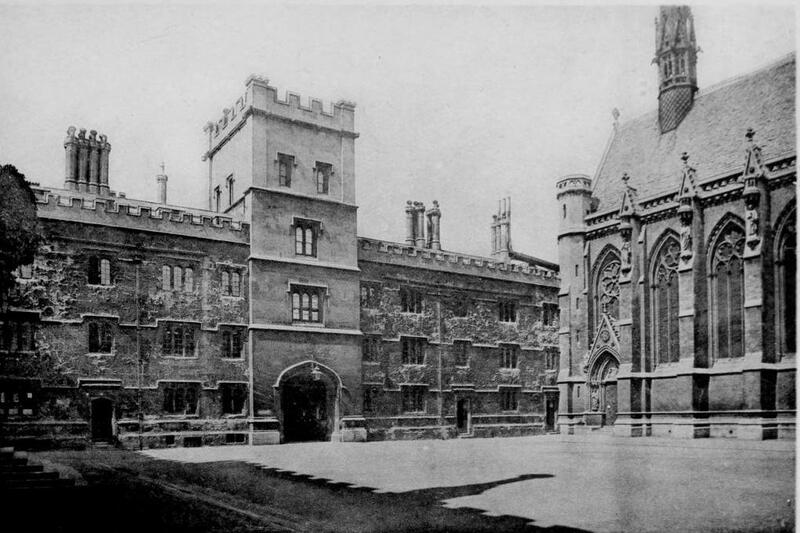 right: Quadrangle. Entering the large Quadrangle, the first object which strikes the visitor is the magnificent Chapel on the N. side, built 1856-9. The Chapel is open free in term-time daily from i to 4 p.m. This masterpiece of the late Sir G. G. Scott reminds us of the Sainte Chapelle in Paris, or of the choir of Lichfield Cathedral, to both of which it bears considerable resemblance. The doorway has on either side statues of Bp. Stapledon and Sir W. Fetre ; the sculpture in its tympanum represents Our Lord giving the charge to St. Peter. In niches surmounting the buttresses are figures of the twelve apostles. Inside, the richly sculptured and inlaid screen, stained glass windows, elegant clustered columns with carved capitals, lofty groined roof, choice wood-carving, and the harmonious effect of the E. end, with steps of Devonshire marble and exquisite mosaics by Salviati, combine to form a beautiful reproduction of the Early Decorated period of Gothic architecture. Canopied stalls in carved oak from designs by Mr. Bodley, R. A., were added in 1884. This fine work, extending nearly the whole length of the chapel on either side, greatly enhances the rich effect of the interior; but its style is somewhat more rigid and conventional than that adopted by the late Sir G. G. Scott in the other decorative work. On 12th May, 1890, the decoration was completed by the placing on the S. wall of a magnificent piece of Tapestry designed by Sir E. Burne-Jones, Hon. D.C. L., A. R. A., and executed by the late Wm. Morris, both Honorary Fellows of this college. The subject, " The Adoration of the Magi," is treated with great originality. Into the presence of the Holy Mother and Child the three strange visitants are entering with costly gifts. Between them and the Holy Babe is an Angel holding the mystic star which has guided them to the Infant's feet. The figures are life-size, and the admirable *x- pression of their faces, the marvellous intricacy and beauty of their apparel, with the richness and variety uf colour throughout, combine to form a piece of work unsurpassed in modern times. N.E. of the Chapel are the new buildings (1855-7) fronting Broad-street. 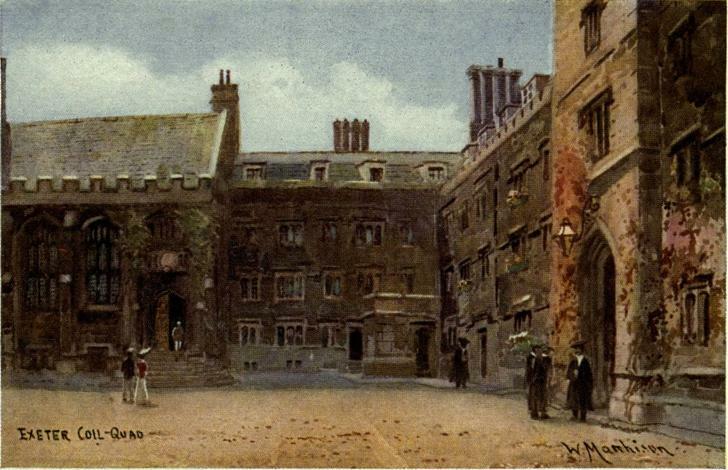 Facing the Chapel, on the South side of the quad., is the Hall built by Sir John Acland in 1618. With its fine timber roof and Perpendicular traceried windows it affords a good example of the revived Gothic of the Jacobean period. In the Hall are portraits of the Founder. . . Samuel the father of the Wesleys, Lord Coleridge, William Sewell the founder of Radley College, Sir Charles Lyell, Bishops Jacobson and Mackarness, Canon Curteis, and Professor Froude, are some of the best known names associated with Exeter College. The Fellows' Garden, small but exceedingly beautiful, is entered through a doorway at the S.E. angle of the quadrangle. 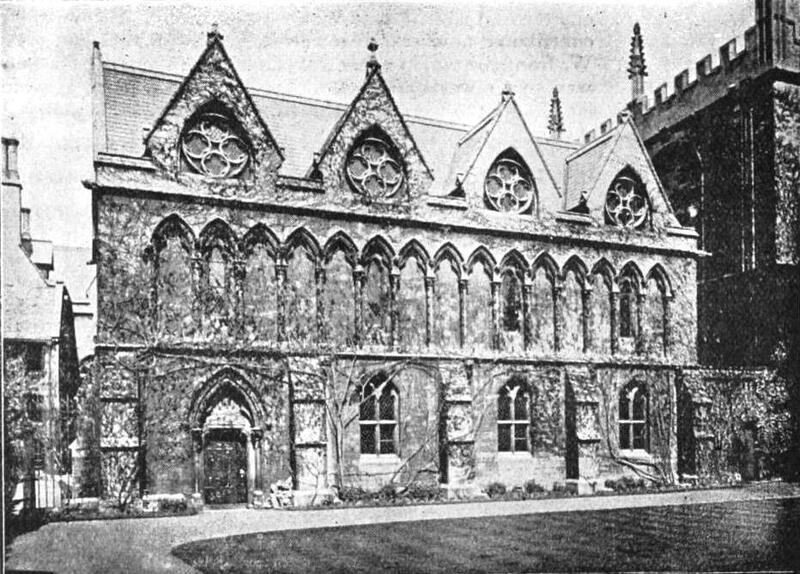 On its N. side is the Library (rich in mathematical works), built in 1856 from a tasteful design by Sir G. G. Scott ; and from the pleasant greensward we get a charming view of the Divinity School and Duke Humphrey's Library, their mullioned windows and picturesque buttresses and pinnacles richly clothed with foliage ; while on the other side the spire of St. Mary's and the dome of the Radcliffe . . . complete a lovely and reposeful picture. Album of Oxford Photographs containing 20 Views printed by the permanent collotype process. Oxford: Miss Beesley, Fancy Stationery Repository, 43, High Street, Oxford, nd. Internet Archive version of a copy in St. Michael's College Toronto. 4 October 2012. Alden, Edward C. Alden's Oxford Guide. Oxford: Alden & Co, 1903. Internet Archive version of a copy in St. Michael's College Toronto. 6 October 2012.